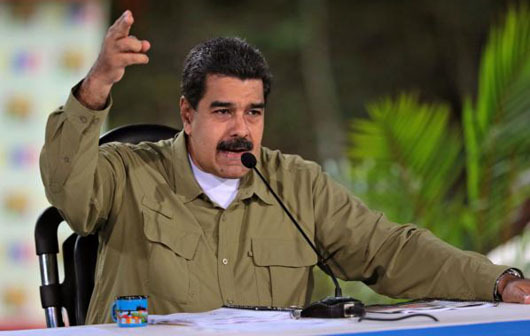 “The production models we’ve tried so far have failed and the responsibility is ours, mine and yours,” President Nicolas Maduro told his ruling PSUV party congress on July 30. “Enough with the whining… we need to produce with or without (outside) aggression, with or without blockades, we need to make Venezuela an economic power,” Maduro said, according to a report by AFP. The International Monetary Fund (IMF) predicted last month that Venezuela’s inflation would reach one million percent this year. The IMF also said Venezuela’s GDP will fall by 18 percent this year, a fourth consecutive year of double-digit drops. “No more whining, I want solutions comrades!” Maduro told the PSUV party congress. Oil production has crashed from a high of 3.2 million barrels a day in 2008 to a 30-year low 1.5 million this year, the AFP report said. Maduro later called the brief power outage during the socialist party gathering an act of “sabotage.” Hours later, on July 31, 80 percent of Caracas was hit by a power outage. While power outages are rare in Caracas, they are routine for many others in Venezuela. Residents in San Juan de los Morros told AFP that almost nothing works in the city of 160,000 residents. Running water is available only once a month, there are daily power blackouts, cash machines are empty and waiting for a bus can take hours, the report said. In San Juan, the cash machines don’t work and residents have to wait in line for hours at banks to withdraw money. They are only allowed to withdraw a maximum of 100,000 bolivars, half the price of a single egg, the AFP report said. Sociologist Francisco Coello says parts of Venezuelan society accepts the crisis because “they’ve not seen anything else” after two decades of chavista governments.